Robert Nickelsberg, photojournalist for TIME Magazine, signs copies of his new book after giving a presentation at Northwestern on photography and Afghanistan. Nickelsberg’s book, Afghanistan: A Distant War, features his photography of the region. After his photographs sat for years in a trunk and file cabinet, photojournalist Robert Nickelsberg compiled a book documenting his experiences in Afghanistan from 1988 to 2013. 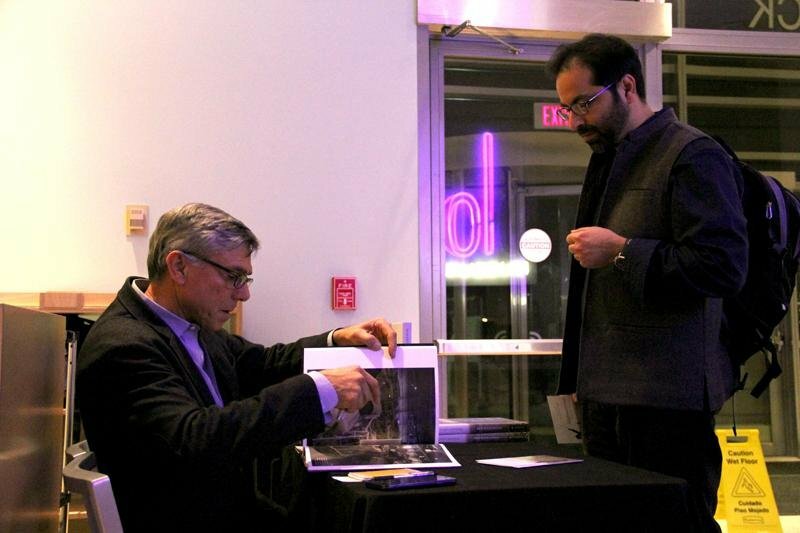 Nickelsberg recounted Tuesday his experiences in Afghanistan and the process of making the book, “Afghanistan: A Distant War,” at the Block Museum of Art. The event featured a slideshow of more than 50 photos and a question-and-answer session hosted by Medill Prof. Craig Duff. Throughout his time in Afghanistan, Nickelsberg experienced the country under Soviet reign and saw the rise of the Taliban and the United States’ attempt to strip its influence. In the process, he was exposed to violence on a regular basis, but instead of documenting the carnage, he looked for something different. He also explained the more time he spent in Afghanistan, the more accustomed he became to danger. “When you work in these countries, you embrace mystery, and ambiguity becomes the norm,” he said. Nickelsberg addressed the question of intervening to prevent horrific events. He recounted a day when he was driving down a street the Afghani government planned to bomb. On the side of the road, there was a citizen whose torso was wounded, with a dead Afghani nearby. His envoy stopped, he took a few pictures and quickly took the wounded man to the hospital, leaving the body behind. Nickelsberg explained that he knew the body would be taken care of but needed to leave the area quickly. Kellogg doctoral student Nevena Radoynovska agreed with Nickelsberg’s approach. After the Taliban banned photojournalists from entering the country, Nickelsberg embedded with American forces four times. However, he explained he never had issues with censorship and just needed to use common sense when deciding what pictures to print. But that didn’t mean he couldn’t push the boundaries a little bit. “Be careful, but be reckless,” he said.